The Mississaugas were the original residents of Cataraqui, settling along the shore of Lake Ontario and hunting for game inland. 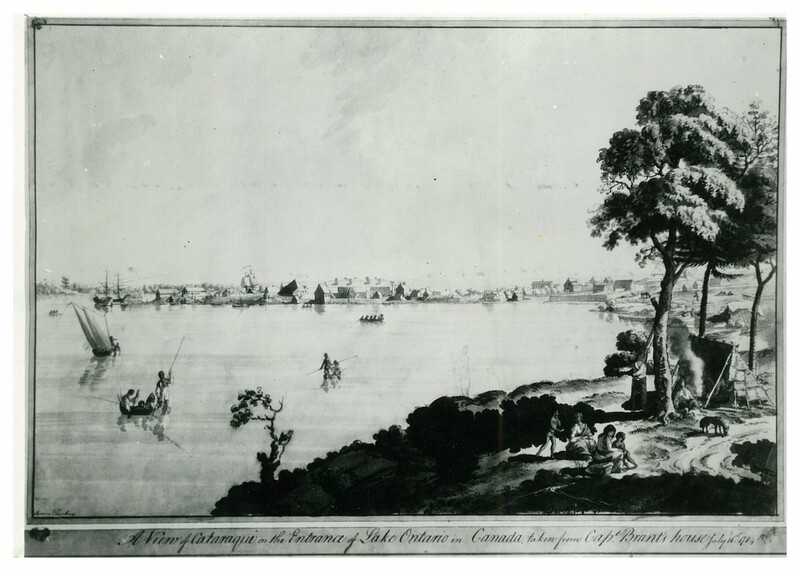 Initially, in the summer of 1783, Joseph Brant suggested to General Haldimand that there be no appeal to the Mississaugas for the land around Fort Frontenac, as it would undoubtedly require their given consent and inspire their claim to payment for their sacrifice. This is, however, exactly what happened: In the October 1783 Crawford Purchase, the elderly Chief Mynass agreed to sell a portion of land in exchange for annual payment of clothing, red cloth, silver, pots and pans and alcohol, among other things. Each summer, the Mississauga would assemble by canoe at Macdonald Park, across from Kingston General Hospital, to receive their gifts. The title “Mississauga” – designated by the French and other settlers – likely refers to the word “Missisakis”, meaning “many river mouths”: The Mississaugas believed that they acquired the name because of the numerous rivers which flow near and around their land (Trent, Moira, Shannon, Napanee, Kingston, and Gananoque rivers). It was General Haldimand’s impression that “the Mississaugas appear much satisfied that the White peoples are coming to live among them”, however it is more likely that they were displeased with the extent of their land that was encroached upon (past the agreed upon territory) and the general sense of disdain and disapproval that they felt from their new neighbours. “There are Mississaga* Indians here. They are an unwarlike, idle, drunken, dirty tribe. I observe how extremes meet. These uncivilized people saunter up and down the town all day with the apparent nonchalance, want of occupation and indifference that seems to possess the London beaux in Bond Street”. The strong opinion portrayed in Mrs. Simcoe’s diary was likely shared by others as well; it illustrates the broader division between European and Indigenous cultures; cultures that had to exist in close proximity to one another in Cataraqui. Although it is apparent that Mrs. Simcoe saw little potential in the Mississaugas, they were evidently capable of religious reform and of improving their nation. 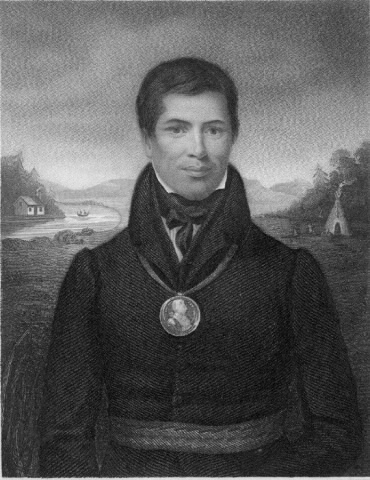 The Mississauga Ojibwa Chief and Methodist minister, Peter Jones, spoke in many communities in Upper Canada, attracting whites and Natives alike. Among his various names, he was known in Mohawk as Desagondensta, meaning “he stands people on their feet”. His sermons were said to be instructional and inspirational and were likely responsible for the survival of the Mississaugas. At a time when the Mississauga (among other Ojibwa bands) were on the verge of collapse, Peter Jones provided a focus on spirituality that proved to be deeply effective for the unity of the nation. Along with his brother he is credited with completing one of the earliest translations of the Bible into Ojibwa, allowing for its accessibility and comprehension among the Mississauga. *The “Mississaga” referred to by Mrs. Simcoe are the same group as “Mississauga” despite the variation in spelling. Macdonald Park, along the shore of Lake Ontario was the designated meeting place for the Mississauga to receive their annual payment for the selling of their land in the Crawford Purchase. Each summer they would assemble by canoe to collect blankets, firearms, ammunition and clothing as they wanted, as well as “as much coarse red cloth as would make about a dozen coats and as many laced hats.” For many years, the Mississauga returned to Macdonald Park to receive this payment.